It is so irritating when you’re trying to have a conversation at dinner time, and the music in the background is the sound of your dog barking. Okay, it’s not music!! I noticed you said Holly sits next to everyone else, but not you. Can I assume you’re the only one who doesn’t indulge the dog? In order to get Holly to stop begging, every single person must be on the same page, and in agreement that the dog is no longer fed table scraps…period. There’s no exceptions, and no slipping her food when no one is looking. When her behaviour doesn’t change you’ll know someone isn’t listening. Okay here’s what to do. Decide where in the room you would prefer she be during mealtime. 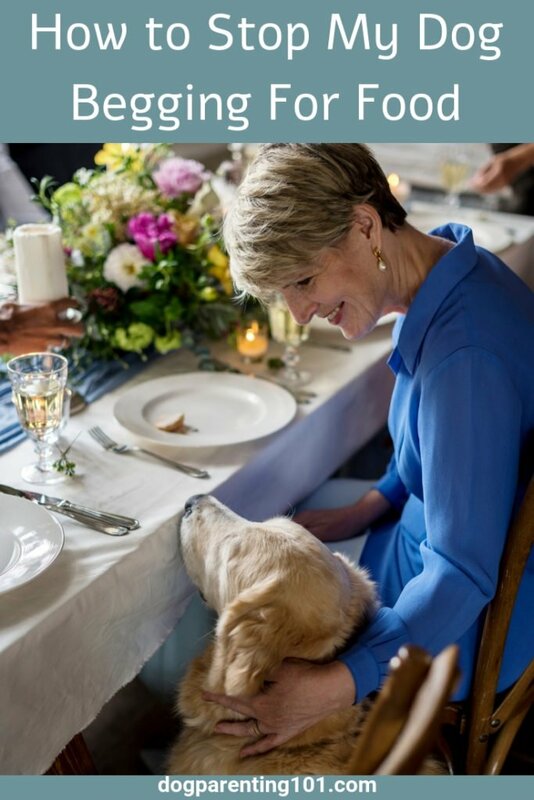 The next time your dog begs stand up, face her, and with your body back her up to that spot, then ask her to “stay” of “lie down.” Be prepared for Holly to follow you back to the table as soon as you walk away, but that’s okay. Repeat the process as many times as it takes for her to learn where her place is at meal times. It will disrupt you, and you may get annoyed if you have to keep doing it, but as long as you are consistent she will learn. You may be pleasantly surprised it doesn’t take her long at all! For extra motivation, why not give her a frozen treat in a Kong or a favourite toy to play with. It will be more effective if it’s something she gets only during this training. This is great advice. Consistency is key to a lot of what we do with our pets, so pet parents shouldn’t give up! Thanks, and I agree with you it’s all about consistency. Stick with the training and you’ll see results. My husband started feeding the new pup from the table. He knows better. Much easier to train pets than people! Oh my goodness! As many years as we’ve had Jack, is how many years I’ve been trying to train my husband. Jack was tough, having come from an abusive background, but I’ve had a lot more success training him then his dad. That’s just hopeless!! 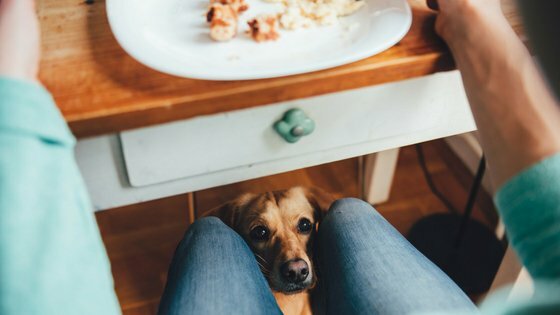 I love the idea of giving your dog a frozen treat to eat somewhere else during your mealtime… Dogs just want to be included! I agree, dogs just want to be with us, so why banish them to another room out of sight, if you don’t have to. We’re eating so he can eat as well!! When I got my dog (a rescue about 6 years old), he didn’t beg. Now he does. That’s my fault. Never starting feeding at the table is key. Easier to not do than fix later. If I ever have another dog, I’ve learned. You’re so right Sherri, not starting in the first place is best!! Luckily you can still stop her begging. In my experience, there is a simple method to stop a dog begging, even though it takes more self-power. Simply don’t give anything. EVER [which is the key] from the table. Dogs are smart and figure out nothing is coming and stop begging for it. Dogs do what works and don’t do what doesn’t. That is what my experience always has been. Just don’t make eye contact with those puppy eyes. Now, in our house, we do give out some of the goodies from our dinner after we’re done with our meal. That also helped the dogs to know to wait because it’s coming. If we have something that is not safe to share, we add something shareable to our plates. You’re too right Jana. The best way to fix it is to prevent it from happening in the first place! That’s certainly a great way to teach them impulse control. I’m guilty of feeding my dogs from the table, but I’ve never had one bark at me, just drool. I usually don’t give them any treats until we are done eating. I like your training trip if the dog is too aggressive around dinnertime. Feeding your dog first may also help. At least the drooling doesn’t give you a headache and make conversation impossible!! Feeding a dog first may help in some cases, although my dogs always love food so they would always be willing and able to eat more!! Thank you Michael! You’re so right. Too many people don’t train their dog, than get annoyed when they misbehave. Sad really, that’s how too many end up dumped in shelters. I find it so hard to resist Kilo the Pug’s big brown eyes looking longingly as we eat anything any time. We both love food and bond over it- he does know I do not respond well to noise so he mostly begs quietly. My husband finds begging annoying and does not give in. He says I need the training not Kilo as I have rewarded unwanted behaviour and he is right. The frozen Kongs or Bully Sticks are a good option when I don’t want to share. I’m afraid you sound like my husband!! He can’t resist Jack’s adorable face, but I’m like a stone. I’m never swayed to give in because it will only get him barking, and demanding. I’m afraid I’m with your husband on this one!! Kongs are such amazing options, perfect for keeping them entertained…and quiet! We are going through the same issue with our dog Misha, but she is learning! This was also a constant struggle with our foster dogs too initially. I know it’s a real struggle for so many, yet something so easy to prevent!! Glad to hear Misha is getting better! To be honest I have to keep an eye on my husband, since Jack conveniently sits under the table during mealtime. I’m okay with that because he doesn’t make a sound, I just have to make sure hubby doesn’t give in to temptation!! My mom puts peanut butter in the Kong and freezes it. She gives it to her dog when they are eating. That’s a great idea, it would certainly keep him (or her) busy for quite some time!